On July 16th, 2011, Time Warner Cable Field was morphed into the North Pole! There was snow on the ground, elves singing Christmas songs, and a festive spirit all around – it was…Christmas in July! The Wisconsin Timber Rattlers went all out for this theme night; inviting fans and all employees to dress in Christmas attire. The team also invited the Salvation Army to bring their red kettles and ring their bells for donations from fans. In addition to that, we encouraged fans to bring in baked goods for our “Bake Sale” where all proceeds would go to the Salvation Army. All fans that donated an item received our Scooter Versus Snowman bobblehead; the team thought it was rather appropriate. The kettles combined with the bake sale raised an astounding $525 for the Salvation Army! The team had an usher volunteer to dress up and act as Santa Claus while his daughter volunteered to be Mrs. Claus. A security guard was able to provide the team with a 13 foot Christmas tree to display by our front entrance. Our customer service manager brought in décor for the stadium, lights for the Christmas tree, and costumes for some of the staff to wear. 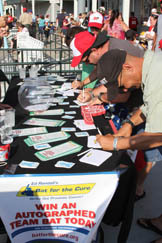 Two very popular events for the Stockton Ports were recently held at Banner Island Ballpark. Root Beer Float Day was held on Sunday, July 10. 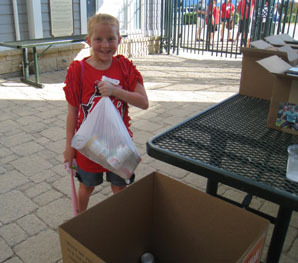 Not only did fans get to cool down with “bottomless” root beer floats on a hot day, but the proceeds from the event went towards the Ports Anchor Fund, which in turn helps local youth centers and youth sports. The event was sponsored by Metro PCS and all of the root beer and ice cream was generously donated by Sunnyside Farms and Super Store Industries. Metro PCS also donated all of the mugs used for the event. Root Beer Float Day also gives fans the opportunity to interact with their favorite Ports players. Ports pitchers Scott Deal, Mike Hart, Josh Lansford, and Rob Gilliam helped out with the event by scooping ice cream and pouring root beer for eager fans. Alongside the players, the Ports had help form radio DJ Lucas from KWIN, Dinger from the Sacramento River Cats, several Sunnyside Farms employees, and of course Splash got in on the fun as well. 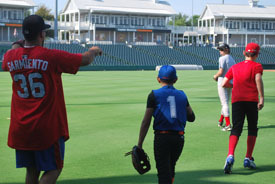 The Ports were also host to two sessions of a youth baseball camp. Youth camp serves a number of purposes. First, all proceeds from the camp go to the Ports Anchor Fund. Camp also gives kids, boys and girls alike, ages 5-13 the chance to learn from the pros. Campers are able to get up close and personal with the Ports players and coaches. Youth camp is all about a fun experience for the kids, but it is also organized each year to teach young kids the fundamentals of baseball. Kids look up to the Ports players, so they always enjoy learning a few new skills from them. Session one of baseball camp was held on June 17 & 18 and session two on July 16 & 17, both from 9 AM to 2 PM. Campers started the day with a warm-up with Ports Strength and Conditioning coach Chris Borgard. After the warm-up, the kids were broken up in to six different groups, according to age. Each station was staffed with a Ports player and the kids were taught a different skill at each one. Ports Manager Webster Garrison & Pitching Coach Craig Lefferts roamed through out each station to ensure the camp ran smoothly. Campers learned all about outfield throwing, base running, hitting, in field throwing, and pitching. The campers also got a special treat with a visit to the clubhouse. A favorite of camp was the end-of-the-day game that they played with the Ports players. The group was divided into four different teams. Two teams in left field, two in right. Each camper had a chance at bat as well as in the outfield. 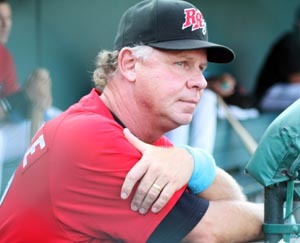 Joining Webster Garrison, Craig Lefferts and Chris Borgard was Ports Hitting Coach Brian McArn. Position players Connor Crumbliss, Leonardo Gil, Ryan Lipkin, Anthony Aliotti, Michael Choice, Rashun Dixon, and pitchers Jose Guzman, AJ Huttenlocker, Connor Hoehn, Scott Deal, and Murphy Smith all helped out. Not only did the campers receive detailed instruction and advice from the players, they were also given a camp T-shirt, were entered in a raffle to win prizes, were given a free Ports ticket, took part in our Jr. Ports program, and were provided lunch each day of camp by Subway and Pizza Guys. If you would like any information on any of these events, or would like to donate to the Anchor Fund, please contact Community Relations Manager Margaret Sacchet at (209) 644-1900 or msacchet@stocktonports.com. 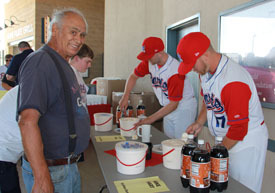 Ports pitchers Scott Deal & Mike Hart scoop ice cream and pour root beer for fans. 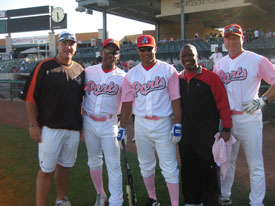 Ports coaches, along with former Oakland A Rickey Henderson, and University of the Pacific baseball coaches all participating in the Home-Run-a-thon. On July 9 we celebrated the Centennial of Naval Aviation at Harbor Park. Wings Over America is a non-profit scholarship foundation that raises money for children of pilots, the crew, and mechanics of air wings to apply for scholarships for there children to attend college. They raised over $1800 for the foundation that night by selling tickets. Two helicopters also participated in the event. 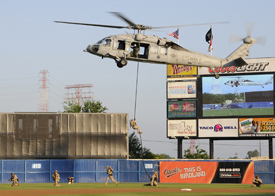 The first one was a helo that hovered at about 30 feet above centerfield and dropped six Navy Seals out of it with the game ball being brought in to Rear Admiral Ted Branch. The second helicopter flew over with the American Flag for the National Anthem and one of the navy gentleman sang the National Anthem. During the seventh inning stretch we had all the crew and seals back to the field to be honored for volunteering there time that night.It was a great night all around and also helped a worthy cause raise money and awareness at Harbor Park. 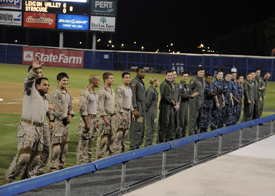 Honoring the crew from the helicopter squadrons at the 7th inning stretch! BURLINGTON, VT — In an effort to promote child safety within the Burlington community and the state of Vermont, the Vermont Lake Monsters and New York Life have teamed up to provide Child Identification services at Lake Monsters home games this season, both the New York-Penn League team and New York Life announced today. Agents from New York Life’s local office will be at historic Centennial Field during approximately 20 home games over the summer to create and distribute personalized child identification cards for no cost. The Child ID card includes the child’s fingerprints, photo and other pertinent information to be helpful in case of an emergency.”New York Life and its Vermont General Office are excited to team up with the Lake Monsters this summer to bring their Child ID services to the people of Vermont,” the Insurance Company said in a statement. “Both New York Life and the Lake Monsters care about children and families and this is a natural partnership-as stewards of the community we want families to be healthy, safe and successful.””We are a team and venue that focuses children, families and the community and when New York Life approached us about this partnership, it was an easy decision,” Lake Monsters General Manager Nate Cloutier. “This free service will help keep children safe, and that is what its all about.”So come out to the ballpark, take in a game, and while there, stop by the New York Life tent and learn about how you can keep your children and family safe, both now and in the future.This article originally appeared on the official website of the Vermont Lake Monsters. Click here to view the original story. The Akron Aeros front office staff made their way to ACCESS earlier this month to help the local shelter prepare recreational rooms at their facility. Upon arrival, the staff got straight to work with paint and brushes in hand. They started with painting a Teen Room, and then moved to painting an office at ACCESS. “It was inspiring to volunteer at a place like ACCESS. To think of all of the individuals they help after these people have been turned down elsewhere, really puts things into perspective. Our staff has really enjoyed this experience, paint clothes and all,” Aeros Suites, Picnics and Community Relations Coordinator NICOLE BLUM said. ACCESS, or The Akron Citizens’ Coalition for Emergency Shelter Services, was created to meet the need for the 625 monthly requests for shelter in the Akron area. With only 150 beds available and just 18 reserved for women and children, ACCESS helps fill the void by providing emergency shelter for those women and children. ACCESS also provides meals, group support, children’s programming, parental programming, and a Care Clinic. “When I picked up a brochure after leaving ACCESS, I read the first line, ‘Providing Help When It’s Needed The Most.’ That quote seems to resonate throughout this organization. They certainly help those in need to the best of their ability. But there’s always more that can be done. That’s where volunteers come in,” Aeros Executive Vice President/COO JIM PFANDER said. 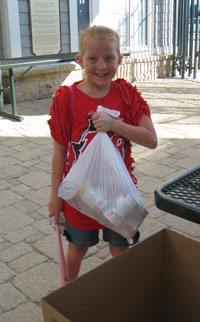 As a part of their ‘Helping Hands’ program, the Aeros volunteer at local non-profit organizations such as ACCESS. Next month, the Aeros will assist The Battered Women’s Shelter of Summit County. For information on ACCESS, visit access-shelter.org, and for additional Akron Aeros community outreach efforts, visit akronaeros.com. Director of Sales, Greg Berry and Manager of Promotions, Calvin Funkhouser prepare the Teen Room before painting at ACCESS shelter in Akron. Aeros staff is all hands on deck, painting the Teen Room at ACCESS. For several years, the Staten Island Yankees have partnered with the ALS Foundation Greater New York Chapter to raise awareness and money for the battle against ALS. Along with promoting nearby Walks to Defeat ALS, Staten Island Yankees employees participated in a 2011 Walk to Defeat ALS along the West Side Highway in Manhattan. An appearance by Scooter the Holy Cow added to the pre-walk entertainment. On July 4th, the Staten Island Yankees partnered with Primary Care Ambulance to help Strike Out ALS. For the game on July 4, Primary Care Ambulance donated $50 to the ALS Foundation for every strikeout pitched by a Staten Island Yankees pitcher. The eight strikeouts and $400 were great, but Primary Care Ambulance decided to pitch in an additional $100. The partnership between PCA and the ALS Foundation was expanded when PCA contributed another $250 to the Staten Island Yankees Kids’ Night Out program to further benefit the ALS Foundation. For the Baby Bombers’ ongoing support, the ALS Foundation presented the Staten Island Yankees with a Certificate of Appreciation. The Baby Bombers are proud to continue supporting the fight against ALS, a disease very close to the Yankee family. 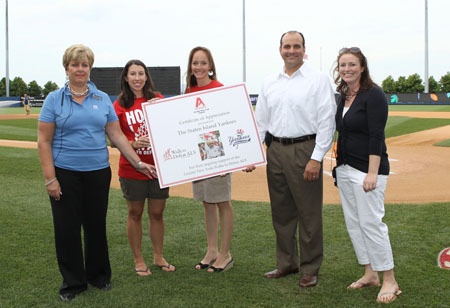 Representatives from the ALS Association present the Staten Island Yankees with a certificate of appreciation at Richmond County Bank Ballpark on July 4, 2011. The Oklahoma City RedHawks and OBI (Oklahoma Blood Institute) hosted the All-American Blood Drive to help ensure Oklahoma’s blood supply on Independence Day weekend 2011. The motto of the day: FEEL GOOD. GIVE BLOOD. 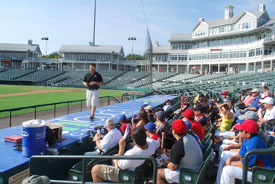 The event was held at RedHawks Field at Bricktown from 9:00 a.m. to 6:00 p.m. on Friday, July 1, 2011. Oklahomans were encoured to give blood (if 16 years of age and older) to receive 2 tickets to the RedHawks 4th of July game and fireworks show. Free parking and hotdogs were also available on July 1st for all of the blood donors. All that just for giving blood and showing Oklahoman pride! The Akron Aeros front office staff traveled to The Salvation Army’s Akron Citadel last month, extending their Helping Hands program in the facility’s soup kitchen, pre-school and storage rooms. The Aeros had the opportunity to see the dynamics of an organization that helps the local community in such diverse ways. The staff assisted with food preparation and dispersion in the soup kitchen, while mingling with those dining and the full-time volunteer staff. Others assisted at the preschool, helping to prepare and deliver lunches to the kids, while spending quality time before naptime for the children. The staff also worked behind the scenes, sorting and organizing the Salvation Army’s arts and crafts supplies, donations and records. “I was able to volunteer on all different ends of the spectrum. You really get a chance to see how dedicated The Salvation Army is to the community. We especially loved spending time with the kids, and they were really enthusiastic. That’s what makes this Helping Hands program so rewarding,” said NICOLE BLUM, Aeros Suites, Picnics and Community Relations Coordinator. Based on the Christian faith, The Salvation Army aims to fulfill their motto, “Doing the most good,” which was evident to the Aeros staff, who left with a clearer vision of the organization and its purpose. From church services, to after school programs, and providing financial assistance, shelter and free meals, the Salvation Army’s Akron Citadel epitomizes their 135-year-old motto. 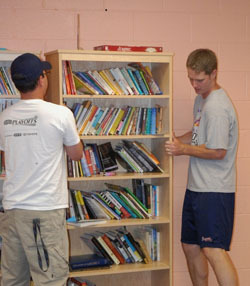 Each month, the Akron Aeros front office staff volunteers at locally based organizations as a part of their Helping Hands program. In addition to the Salvation Army, the Aeros plan to assist Akron’s Habitat for Humanity as their next venture. The staff gathers for a group photo after serving hot meals during the Salvation Army lunch hour. 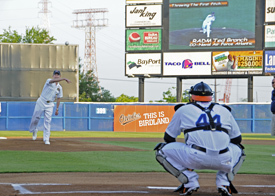 On Thursday, June 30th, Ed Randall visited the Richmond County Bank Ballpark for his Bat for the Cure Program. This program was founded in 2002 to increase the public’s awareness of prostate cancer and to educate the American people about cutting edge techniques in treatment, prevention and detection. Prostate cancer is no longer the death sentence it once was. There is a 96-97% cure rate if it is caught early. Ed’s mission is to encourage men over the age of 40 to take simple blood tests that could save their lives. On this day, the Staten Island Yankees players wore blue wristbands during the game to support of program. Staten Island Yankees fans also had a chance to visit the Bat for the Cure table on the concourse to enter in a raffle to win a team signed blue bat. The Staten Island Yankees have supported Ed Randall and his program for the last several years and we look forward to a continuing our relationship to strike out prostate cancer together! The Staten Island Yankees players wore the blue wristbands throughout the game to show their support for Bat for the Cure.